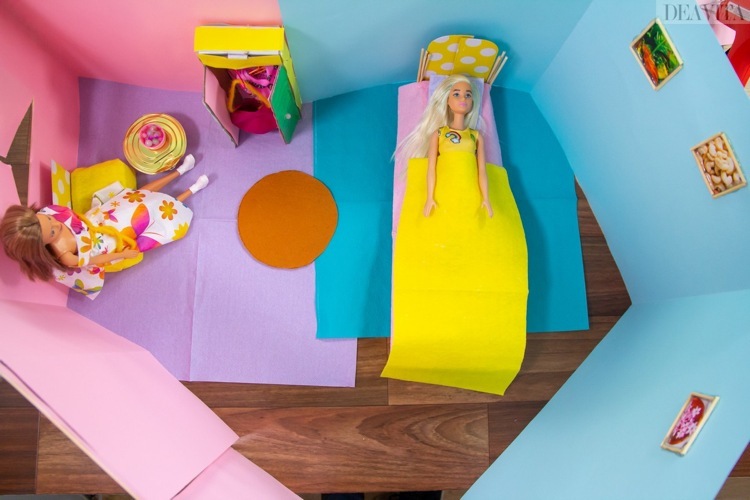 There is hardly a girl who does not enjoy a dollhouse – the toy has proven itself over the years as an absolute classic. Those who find the modern versions made of plastic too impersonal can get the old wooden house out of the basement, repaint it and prepare it for the next generation. 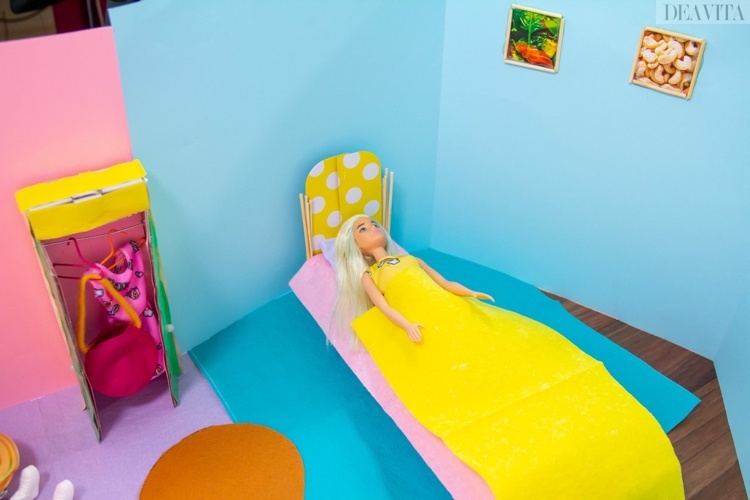 Of course, the furniture for the dollhouse should not be missing. If the old furniture is damaged or completely missing, creativity is in the first place. 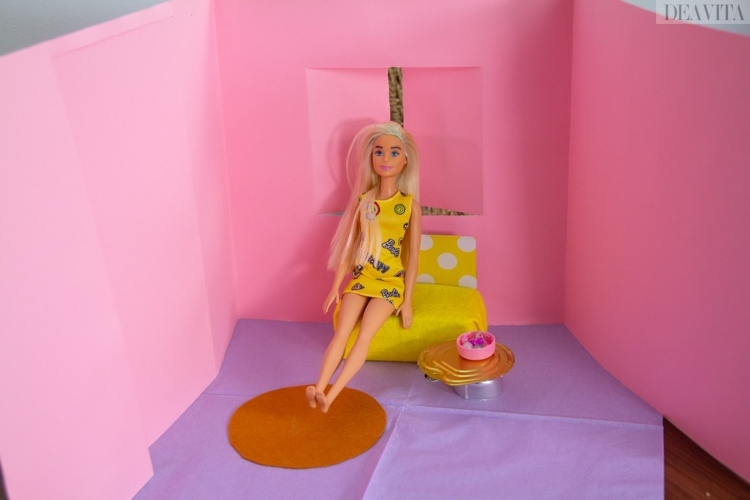 We will show you 15 DIY Dollhouse furniture ideas. Be inspired by the suggestions – the instructions are super easy and suitable even for beginners. DIY Dollhouse furniture ideas – how to make a paper house extension? 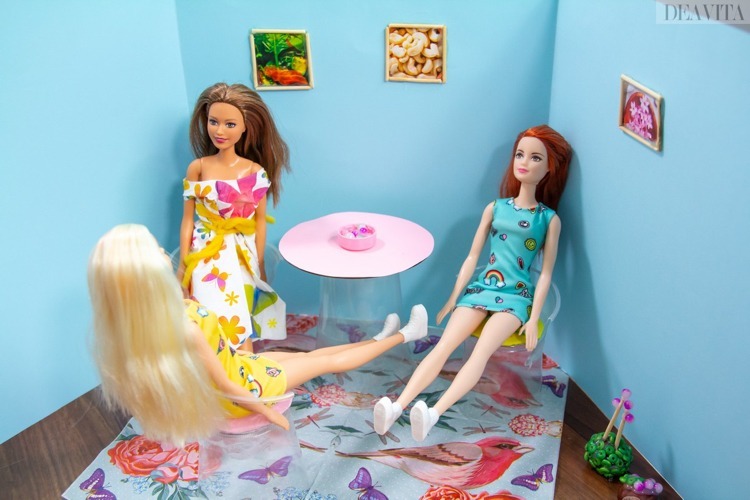 Does the old dollhouse need a house extension – for example, because there is not enough room for all Barbie dolls? 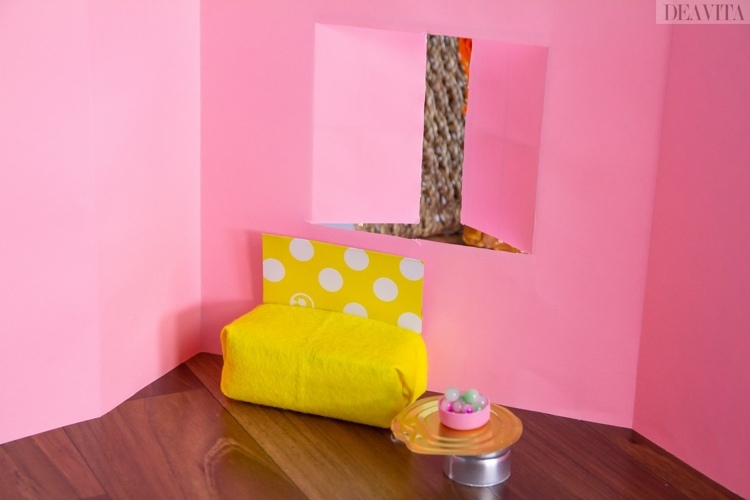 Then a guesthouse made of paper offers a fast space solution. Simply cut out the walls from cardboard. For the door and the windows cut openings, glue the door and window sashes with wooden sticks for more stability. Now just assemble the house – and arrange the toys inside. Make holes into the chestnuts with the screwdriver, insert the wooden sticks and glue them in place. Decorate the chestnuts with the wooden and glass beads. The walls in the new guest house should not remain empty. 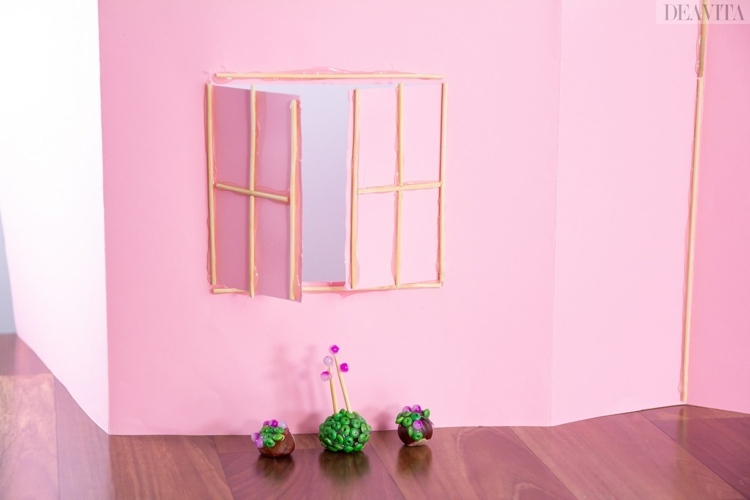 Cut out several photos from old magazines and make photo frames from wooden sticks. 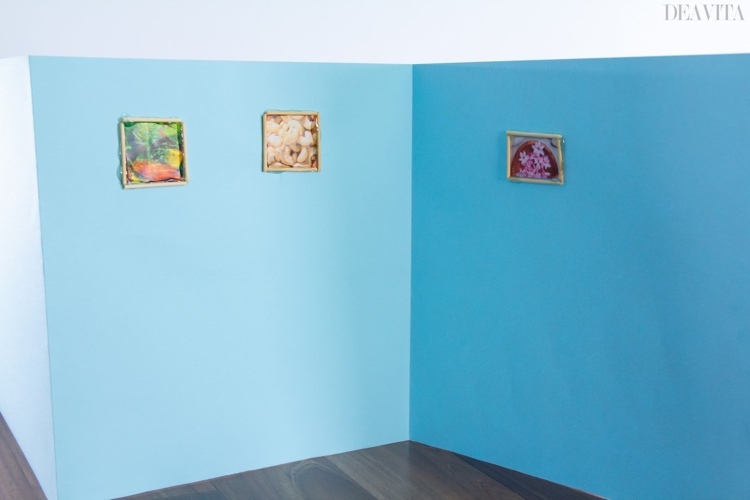 Arrange the photos and glue them to the wall. 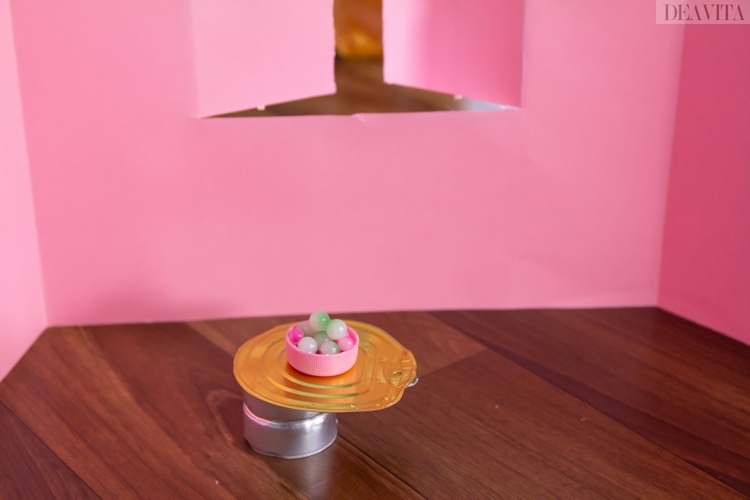 First we will show you how to make a coffee table from two tea candles and a can lid. 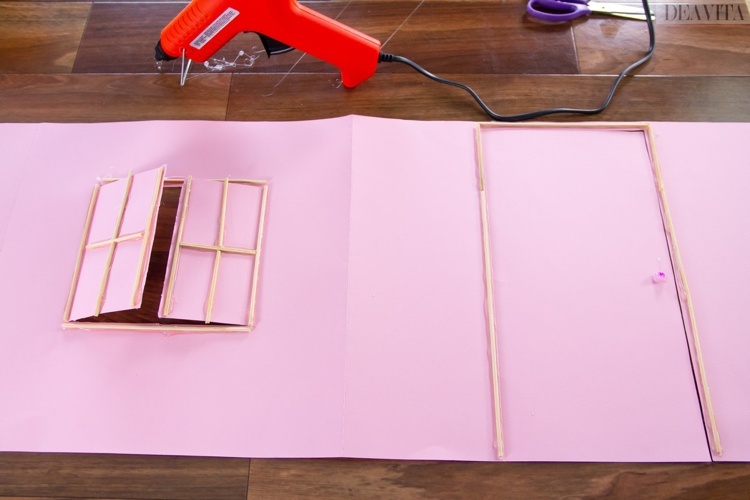 All you need for this craft project is a hot glue gun. You can decorate the table with a “bowl” – actually a bottle cap filled with glass beads. First glue the two tea candles together and let it dry. They will form the pillar on which you will attach the tabletop later. 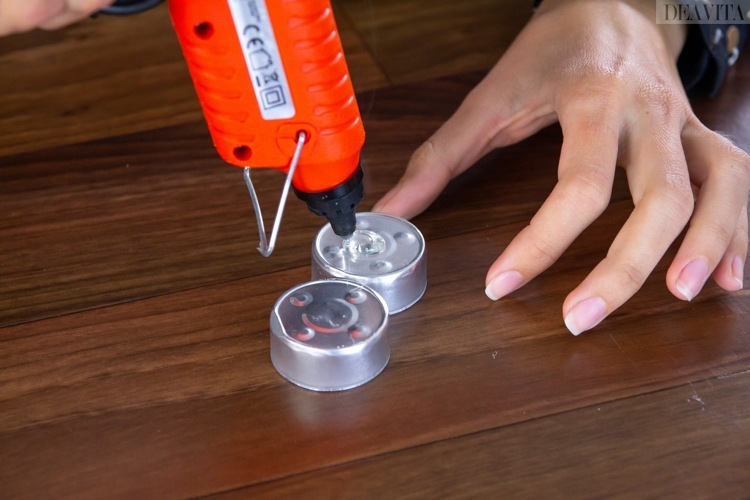 Now place the can lid on the tea candles table base and fix with the hot glue gun. We recommend to a use a file or sandpaper to make the sharp edges safer. 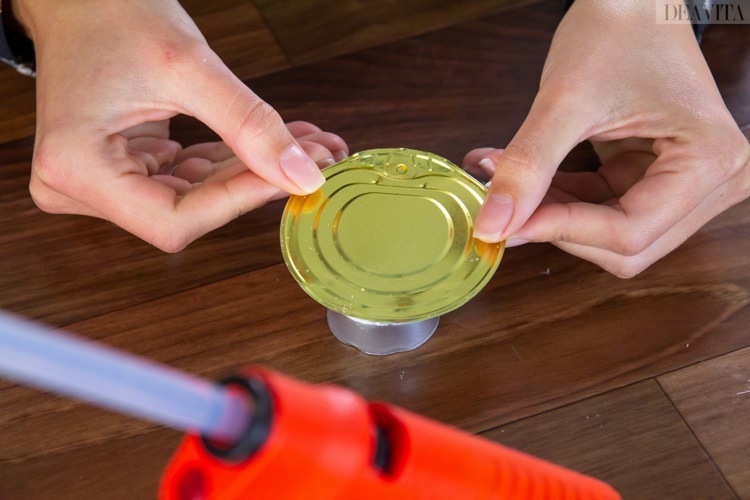 Optionally, you can use a plastic can lid for safety. 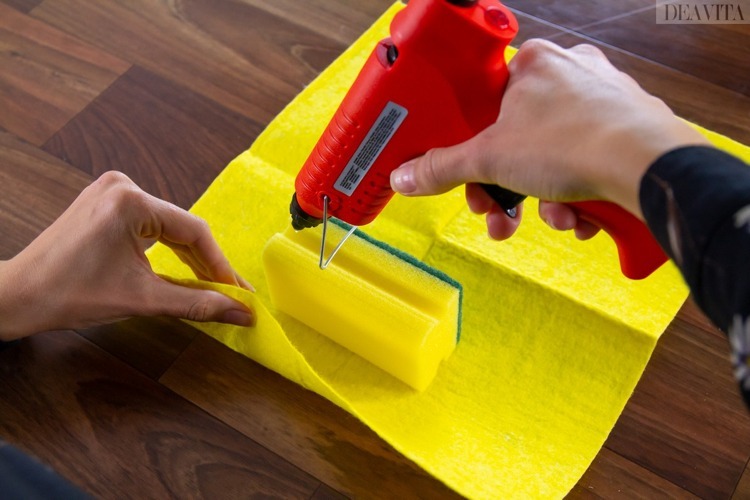 Wrap the sponge with the felt and glue the ends of the fabric together. Cut out a detail from the cardboard for the backrest. If you wish, you can paint it or decorate it with wrapping paper. 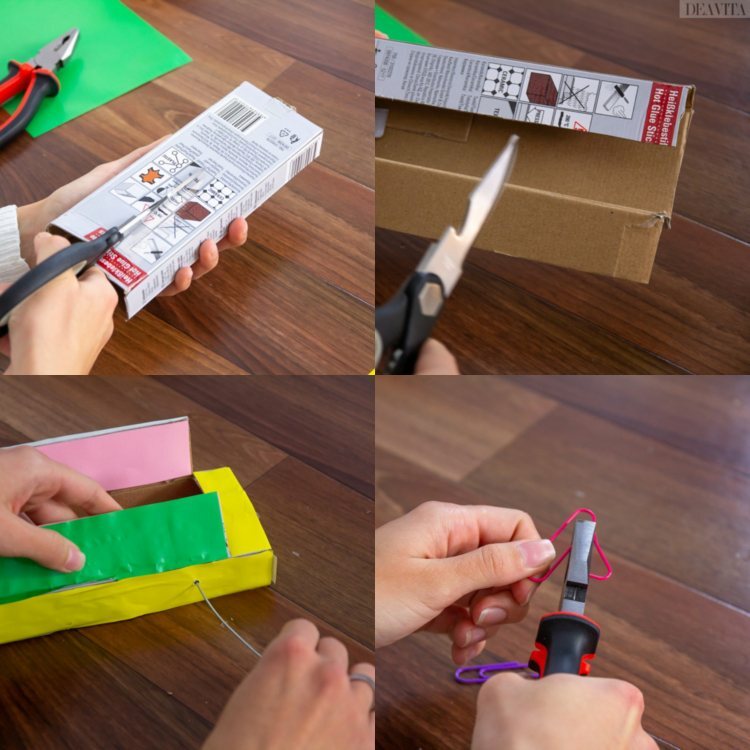 Secure the cardboard detail with the hot glue gun. Finished! A round rug made of felt adds the finishing touches to the living room and completes the furnishings in the lounge area. Draw a circle on the felt using a compasses and a pencil, cut it out and position it in front of the sofa. Follow the photo tutorial above step by step. When the wardrobe is done, bend the paper clip with the wire-cutters so that it looks like a small hanger. Glue colored wrapping paper on the sides of the box. 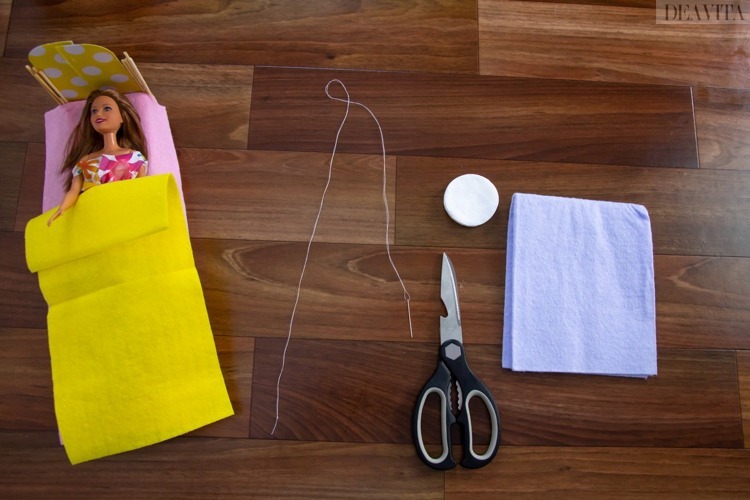 Glue a piece of pink felt (it will serve as a bed sheet for Barbie) on the upper side. Cut out the headboard from cardboard, stabilize with the wooden sticks and secure with the hot glue gun. 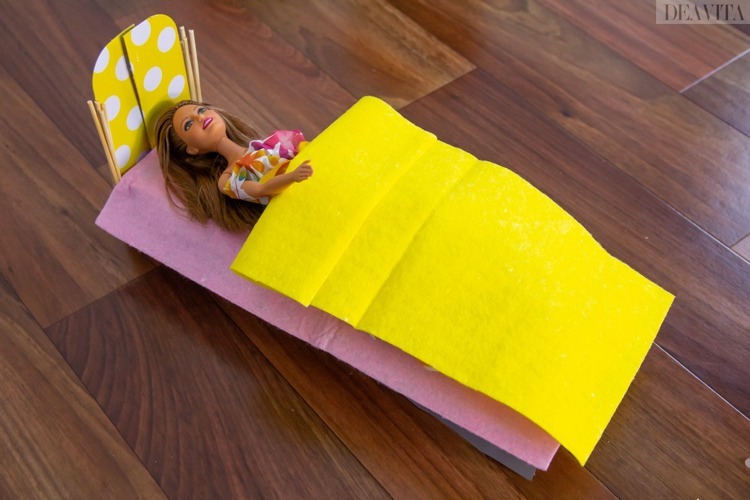 Use a piece of yellow felt as a blanket. Fold the cotton pads in two and use them as a “filling” for the pillow. Then sew the ends of the square piece of felt together. 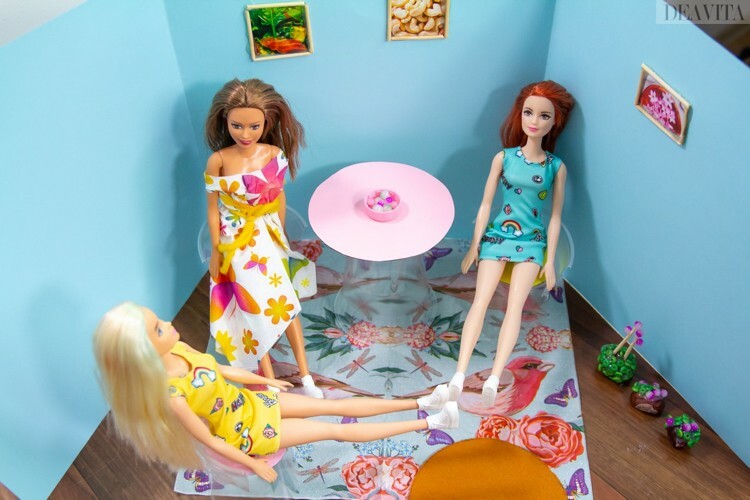 In this cozy dining room Barbie can spend the evening with her friends while having dinner. Decorated with colorful pictures on the walls, cozy house plants and a high-pile carpet made of paper napkin, the room is cozy and inviting. Only the dining table and the chairs are missing. Use the CD as a template and cut a circle out of the cardboard. 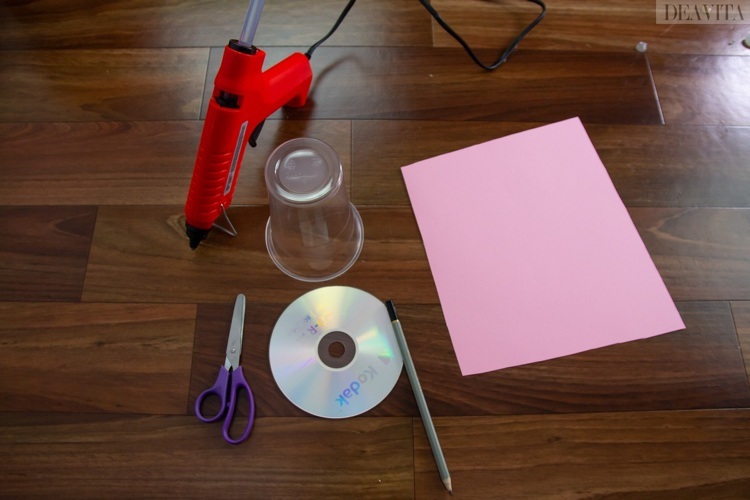 Glue the pink circle on the CD and let it dry. 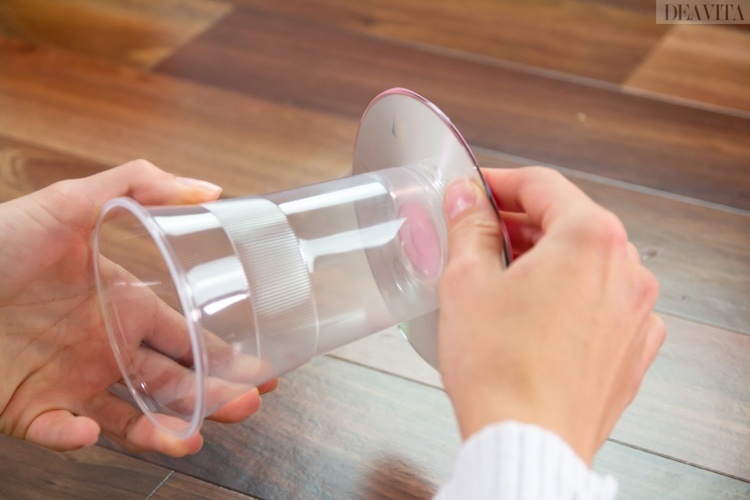 Glue the plastic cup and the CD together (see photo above). 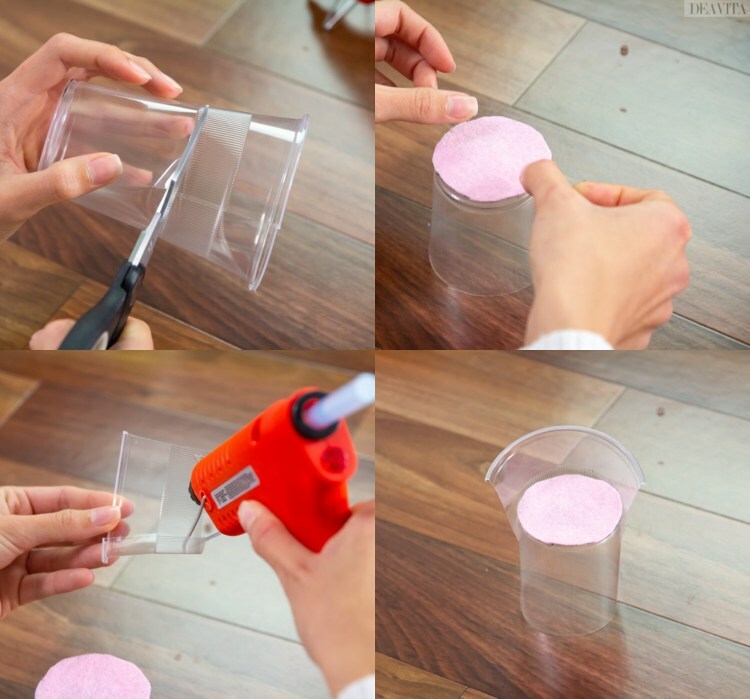 For the four chairs you need four plastic cups, pink felt, scissors and a hot glue gun. Follow the photo tutorial above. 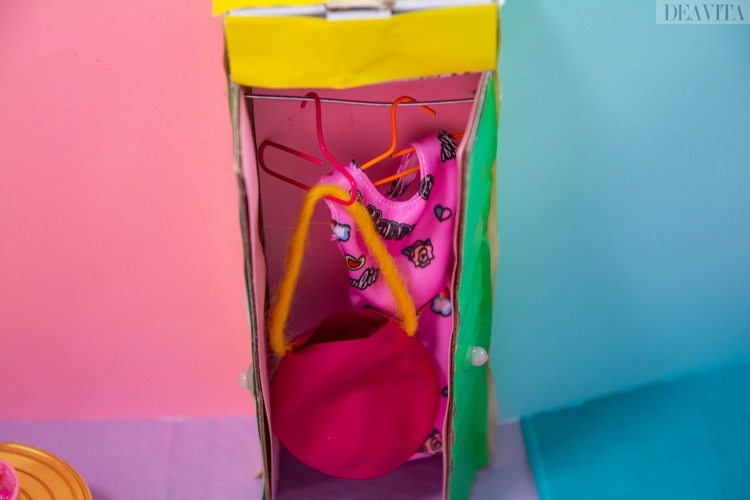 The post DIY Dollhouse furniture ideas – 15 craft projects with household items appeared first on Deavita Interior design and Architecture Magazine.